Whether you are a mobile storage veteran or novice, the idea of manipulating a portable lift system may sound like an intimidating task. We understand that operating a machine weighing thousands of pounds may sound difficult, but it really isn’t. The Horizontal Lift system has safety factors built in making it completely safe to operate. To mitigate concerns, we put together this post to answer some of the questions we commonly get about the safety of the Horizontal Lift system. How Does the Container Lift System Work? When understanding the safety of the Horizontal Lift system, it may first be beneficial to understand the parts of the system as a whole. The Horizontal Lift system is fitted on to either a 26k GVW truck chassis or a 33k GVW truck chassis. Similar to cargo container attachments, the lifting lug is secured to the portable storage container using a “T” shaped pin. The Horizontal Lift System consists of hydraulic hoses, cables and chains. The Horizontal Lift system can be operated using a remote. This gives the driver or operator more freedom to move around and inspect the area while unloading or loading the container. What Can the Horizontal Lift System Hold? The cables and chains used by the Horizontal Lift system have a three-times safety factor of a fully loaded container. While the Horizontal Lift has safety features preventing it from picking up more than it is designed to lift, we still thought it would be fun to talk about how much it is capable of lifting. The three-times safety factor of the Horizontal Lift system means the 10k lift can hold a storage container weighing 30,000 pounds and the 13k lift can hold a storage container weighing 39,000 pounds. As a benchmark, a weight of 39,000 pounds is comparable to around 130 refrigerators. With that being said, we do not recommend trying this, mainly because the built-in bypass on the hydraulics system will not allow it. If Something Goes Wrong, Will the Horizontal Lift System Drop? If the hydraulic lift hose is cut or if the system loses power, the container will not drop. The Horizontal Lift will simply stop, shut down and stay in place until the hose is replaced or power is returned. This will happen regardless of if the container is empty or fully loaded. The Horizontal Lift storage lift system is unlike any other lift in the industry. We built the container lift system with the safety of you and your customers’ items in mind. Our no-tilt lifting system keeps the contents of the storage container from getting jostled, while our built-in safety features help to keep the operator safe. 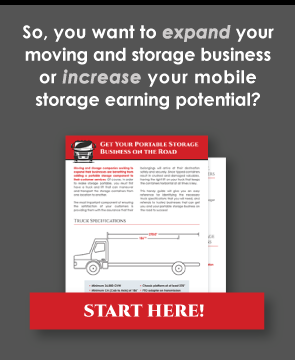 Do you have additional questions about the Horizontal Lift system or the mobile storage industry? Download our free eBook!